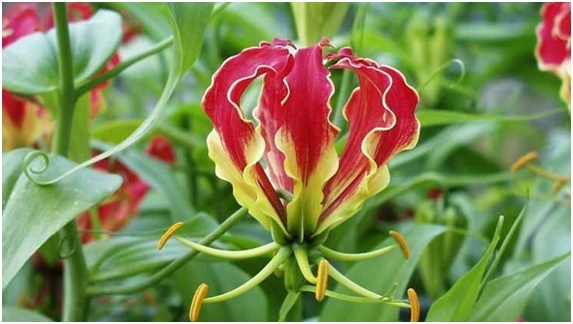 Gloriosa superba is a species of flowering plant in the family Colchicaceae. This plant is poisonous, toxic enough to cause human and animal fatalities if ingested. Every part of the plant is poisonous, especially the tuberous rhizomes. The alkaloid-rich plant has long been used as a traditional medicine in many cultures. It has been used in the treatment of gout, infertility, open wounds, snakebite, ulcers, arthritis, cholera, colic, kidney problems, typhus, itching, leprosy, bruises, sprains, hemorrhoids, cancer, impotence, nocturnal emission, smallpox, sexually transmitted diseases, and many types of internal parasites. It is an anthelmintic. As with other members of the Colchicaceae, this plant contains high levels of colchicine, a toxic alkaloid. It also contains the alkaloid gloriocine.